Its been a long time since I updated this blog for which apologies! It’s been an exceptionally busy period as you will see from the below where I try to give a flavour of some of the things that have been going on. I have become leader of the working group considering energy efficiency for the EU Project “European Network for Shallow Geothermal Energy Applications in Buildings and Infrastructures (GABI)”. Overall the project aims to build a new European network of researchers and engineers to address the challenges of thermoactive structures in terms of thermal and mechanical design. To date within my working group we have been gathering databases of thermoactive geostructures in Europe, pulling together thermal demand conditions and starting to consider design scenarios. The work has led to a number of useful collaborations. In the spring of 2016 my Italian colleagues from Trento and Torino visited the UK and we applied ourselves to the problem of the factors influencing the thermal efficiency of energy diaphragm walls. This can be a particularly relevant energy solution in the construction of metro stations where there may be available additional heat from breaking of trains. Of particular interest was the role of the internal (within the metro station) boundary condition for the problem, which is where these heat exchangers would differ to the traditional foundation heat exchangers I have been working on so far. With input from the dissertation of an Erasmus student from Padua we began to observe how the importance of the heat from the station will become increasingly significant throughout the lifetime of the structure. 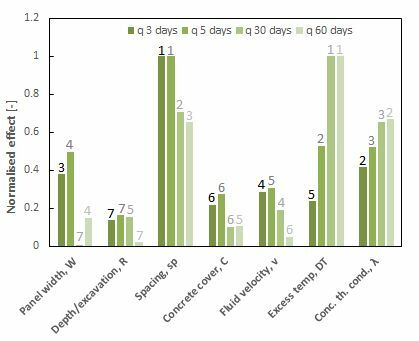 The relative importance of different design parameters on the performance of energy walls at different timescales. In collaboration with colleagues from the French Geological Survey we have also been working to test a resistance-capacitance model for pile heat exchangers developed as part of the French research project Gecko. Traditionally ground heat exchanger design considers the heat exchanger to be purely resistance – ie there is a constant temperature difference across the heat exchanger. However, for large sized foundations it is important to also include capacitance – the ability to store energy. The model was tested against some thermal response test datasets and found to perform well. The work also further demonstrated the importance of having long duration datasets to properly characterise pile heat exchangers given the major role this capacitance plays in their thermal behaviour. I have been working on a project to characterise the average temperature of energy piles or pile heat exchangers. The motivation for this work stems from the fact that current thermal design processes focus obtaining the temperature of the circulating heat exchange fluid as this is required for design of the heat pump. However, thermo-mechanical calculations must also be carried out during the design to confirm that the temperature changes in the pile will not adversely effect its ability to function as a foundation. Consequently I have been starting to develop design charts for the average temperature based on the temperature routinely calculated by the thermal design (the pile edge and pipe edge temperatures will be determined on route to the fluid temperature in most cases). The preliminary work on this topic was recently published at the ASCE GeoChicago conference. Preliminary design chart for determining the central temperature (Tc) in an energy pile relative to the pile edge (Tb) and pipe edge (Tp) temperatures. This has been shown to be a good proxy for the average pile temperature. See my publications page for recent papers on failures in infrastructure embankments and a review of analysis methods for energy geostructures. Also ongoing is work about groundwater effects on ground heat exchangers, CT scanning for thermal effects in porous media and investigation of railway earthwork failures in terms of key trigger and susceptibility factors.